1. How much does it cost to bring a group of students? 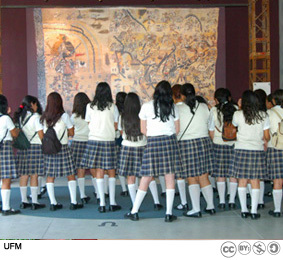 Student groups from elementary, middle, and high schools may visit the Lienzo de Quauhquechollan, Q5.00 per student. 2. Can I visit the exhibit before I bring my class? Teachers are encouraged to make an appointment to visit the exhibit and receive a free guided tour before their class field trip (several teachers can participate in the same visit). This is an excellent opportunity to learn about theLienzo de Quauhquechollan and to begin to prepare your classes. Teachers that bring a car do have to pay for parking on campus (parking fees are Q16 per hour). 3. Where is the Lienzo de Quauhquechollan exhibit? The Lienzo de Quauhquechollan exhibit is located on the ground floor of Liberty Plaza, in the cultural center of Universidad Francisco Marroquín, in zone 10. 4. How many students and teachers can visit the exhibition at one time? Ideally a group should not exceed 40 people. If necessary, the guides can divide large groups into smaller ones in order to accommodate them better. 5. What grades is the exhibition aimed at? The guides can tailor visits to each group’s specific needs and level of preparation. Students who have begun to study the history of Guatemala or Latin America—and who have learned something about the Spanish conquest—will get the most out of their visit (in general, students in fourth grade and higher). Be sure to discuss any questions you may have when you make your reservations. 6. How is this different from a visit to a museum? The Lienzo de Quauhquechollan exhibit is unique because it brings history to life through modern technology. The guided tour is dynamic. It uses technological, visual, and storytelling elements to reveal the history recorded in this 500-year-old document. During the tour, students use their observation and interpretive skills to analyze the Lienzo’s content, as they see the story unfold through the video. Knowledgeable guides, who have experience working with children, answer questions and encourage discussion. 7. How can I integrate the Lienzo exhibition into the curriculum? The Lienzo de Quauhquechollan offers a perspective of the conquest that is not well known. A visit to the exhibit can enrich a curriculum that is examining the history and conquest of Guatemala and Latin America, Spanish colonial history, pre-Columbian art and writing, or indigenous history. The details in the Lienzo—plants, musical instruments, weapons, clothing, and place glyphs—make it a useful tool for learning about more specific subjects as well. 8. Will all my students be able to see and hear the presentation? Each station is defined by a carpet and is designed so that everyone sitting within this area, or on the bench, is able to hear the narration and have a view of the screen. 9. Can we visit the university, too? Of course! 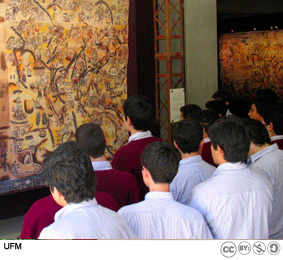 Many schools combine their field trip to the Lienzo de Quauhquechollan with a visit to one of the other museums on UFM campus or the library. Students in their last year of high school may also schedule a guided tour of the campus coordinated by the admissions office. 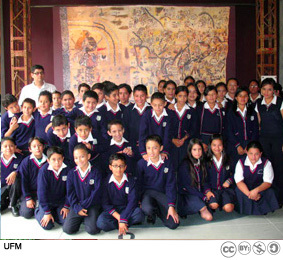 Grades K-12 visit the Lienzo de Quauhquechollan exhibit free. Our guides can adapt your visit to fit your particular group’s needs. The Lienzo exhibit brings history to life through modern technology.